Always Buy American Made USA Flags! When discussing my business to someone unfamiliar with the flag industry, I am often asked, “what issues do you face in your business?”. I know this is a fishing question to determine if our businesses can somehow work together. Issues in the flag industry are similar to most small businesses, but a major issue right now is: the sale of counterfeit United States Flags online. What on earth is a counterfeit US Flag? A counterfeit American Flag is a foreign made US Flag that is not labeled. Labeling laws require the Country of Origin and Material Content on the product until in the hands of the end-user. Why is this important? There are many online retailers that are using deceptive words to disguise the “country of origin” when adverting a United States flag product. They are not labeling the flag with the country of origin or material content, which is against the law. Did you know, $5,973,000 in US Flags were imported in 2017? That number is anticipated to increase in 2018. *The end-user believes they are showing their patriotism by flying a United States Flag that is made in the USA. *The material and workmanship of a counterfeit flag could impact the reputation of manufacturers located in the USA. *Retailers, like myself, cannot compete, price wise, with an online, illegal imported flag. *US manufactures are in a very difficult position as their brand is being compromised. Plus, with almost $6 million dollars in imported flags coming into the US, sales are impacted, which results in a loss of American workers. Custom Flag Company is dedicated to selling only AMERICAN MADE US Flags. We belong to two organizations who sole purpose is to promote United States flags that are manufactured in the USA. **National Independence Flag Dealers Association (NIFDA): ALL members must abide by a Code of Ethics where flag dealers will strictly adhere to a policy of selling US flags that are only Made in the USA. **Flag Manufacturers Association of America (FMAA): As a Retailer, our company agrees to only distribute US flags that are Made in the USA and include FMAA’s “Certified Made in the USA” logo. What can you do? Next time you order an American flag online, look for the county of origin on the listing, check the flag for labeling. Is there a label ON THE FLAG stating the country of origin and material? If not, it is counterfeit. Send it back and write a negative review. 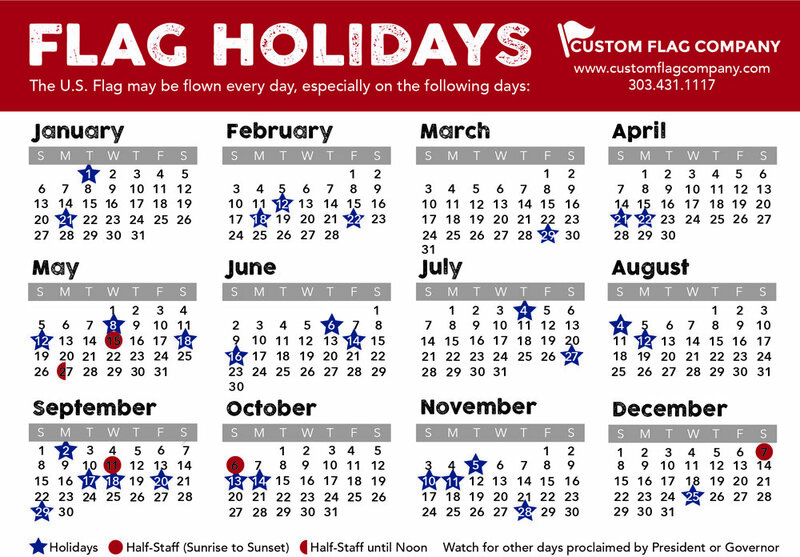 Most importantly, when ordering a flag online or in person, confirm the flag seller is a FMAA Retailer or a NIFDA Member. You will have the peace of mind knowing your United States Flag is MADE in the USA. Here is a great article discussing this very important issue. Major sellers of American flags get their products from China, an audit found. The flags, in some cases, are marketed as being made of U.S.-made nylon, but are actually made of polyester typically produced in China, two labs determined. The flags don’t include label that show their country origin or material content, which is required by law. The Flag Manufacturers Association of American (info@fmaa-usa.com) says the flags are being sold illegally and has requested the Federal Trade Commission (FTC) launch an investigation. THANK YOU FOR READING! Again, please buy American Made USA Flags! Posted on November 12, 2018 by Kim Griebling and filed under Flag Facts, NIFDA, Sale, US Flag.